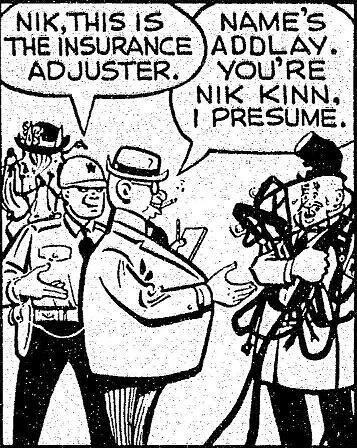 Addlay was an insurance agent who attempted to stiff carriage driver Nik Kinn after his carriage was destroyed by his horse Dobbie. The animal had gone wild as a result of Posie Ermine and his daughter Mindy attempting to steal an incriminating hat off the horse’s head. The shyster, Addlay was convinced to pay for the carriage after Dobbie stomped on his foot.